Born in Mainland China, Viola and her mother moved to Taiwan during a turbulent time in China’s history. Viola’s Providence devotion began when she attended a convent school in Taiwan. After finishing her schooling, Viola was employed as a secretary but Providence came calling again. Her former school, Providence English College, requested she return to be a teacher and she gladly agreed. She married, had children and lived in various countries such as Taiwan, Laos, Vietnam and Thailand. Viola became a popular fashion model, quickly being mentioned in the society columns of the Bangkok papers. 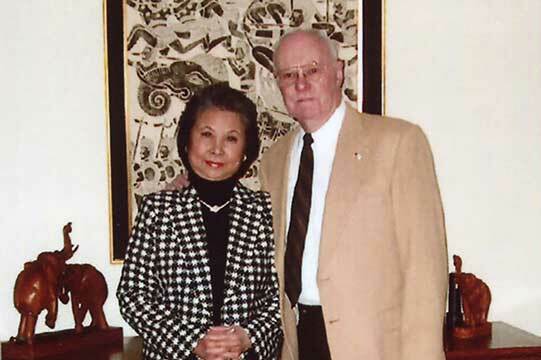 Viola and her family came to the United States where Viola became the owner and manager of the China Rose restaurant in Arlington, Virginia. In loving memory of Viola, who passed away in 2016, retired Army Col. Emil wanted to honor her love and devotion to the Sisters of Providence. An endowment was established to provide income for travel and incidental expenses to and from Taiwan for sisters for the purpose of education, retreat, family visits or bereavement. A secondary purpose is for travel and attendance for women in formation to attend programs relating to ongoing spiritual and religious formation. (Emil’s express intent is that our sisters fly in comfort for the long flights). As a result of his generous memorial gift, Emil and Viola were recognized with the Rooted in Providence award at the 2018 Saint Mother Theodore Guerin Donor Dinner. And so the hospitality of the Sisters of Providence carried in Viola’s heart and life with Emil lives on. Thank you, Colonel Emil Klingerfus, for helping to ensure that the SP connections stay strong and that our Sisters in formation can travel more safely and comfortably as they begin to carry on Mother Theodore’s work. If you travel to Indianapolis, our home is open to you!……and other members of the SP Community as well. What a generous and fitting tribute to Viola! Our ministry in Taiwan has been blessed…such good work is happening there. Thank you, Emil, for caring for those who minister there and for the education of our sisters in formation.